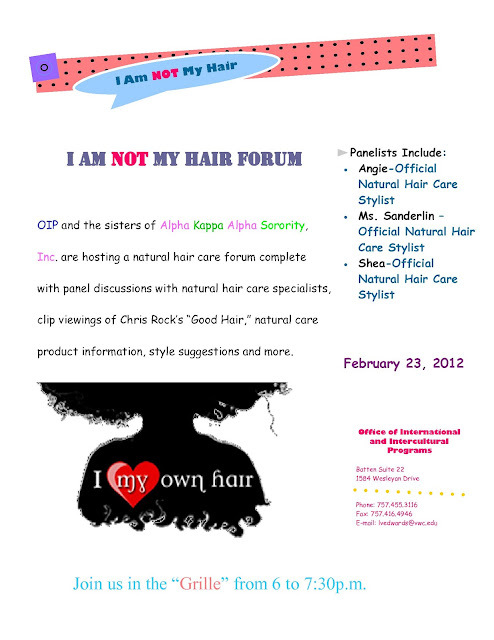 Virginia Wesleyan College's Office of International and Intercultural Programs is hosting a I Am NOT My Hair Forum for African American Heritage Month. The forum will consist of panel discussions about natural hair care, products and styles along with clip viewings of Chris Rock's "Good Hair" and India Arie's "I am Not my Hair video." I have been invited to sit on the panel to discuss natural hair care. You are cordially invited as my guest. This event will be on THURSDAY, FEBRUARY 23, 2012 from 6 to 7:30 p.m. at Virginia Wesleyan's "Grille" inside of the Jane P. Batten Student Center.